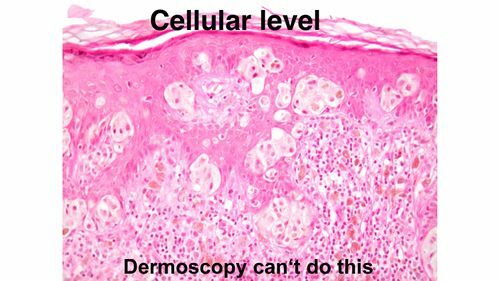 Description In this chapter we describe the difference between histologic and dermoscopyThe examination of [skin lesions] with a 'dermatoscope'. This traditionally consists of a magnifier (typically x10), a non-polarised light source, a transparent plate and a liquid medium between the instrument and the skin, and allows inspection of skin lesions unobstructed by skin surface reflections. Modern dermatoscopes dispense with the use of liquid medium and instead use polarised light to cancel out skin surface reflections. criteriameasure of how well one variable or set of variables predicts an outcome including the use of immunhistochemistry. 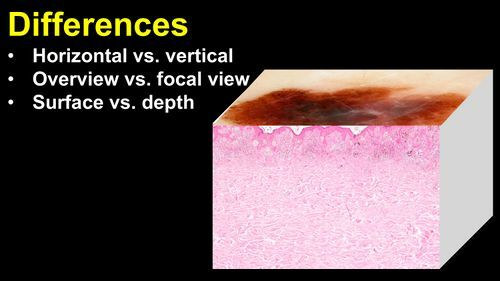 Pathology, Dermatopathology, Histology, Dermoscopy, Melanoma Differences between histologic and dermoscopic criteria – cite! Differences between histologic and dermoscopic criteria (message) Differences between histologic and dermoscopic criteria – participate! Histopathologic evaluation is performed on vertical sections of tissue, thus allowing the assessment of the full depth of the lesion from scanning magnification to a cellular-level magnification, however it directly assesses less than 2% of the lesion. Since histopathologyThis glossary term has not yet been described. is based on paraffin embedded tissue, an additional advantage is the use of special stains and immunohistochemical techniques (e.g. MelanA, S100, HMB45 etc.) that may assist in diagnosisis the identification of the nature and cause of a certain phenomenon. Diagnosis is used in many different disciplines with variations in the use of logic, analytics, and experience to determine "cause and effect". In systems engineering and computer science, it is typically used to determine the causes of symptoms, mitigations, and solutions. DermoscopyThe examination of [skin lesions] with a 'dermatoscope'. This traditionally consists of a magnifier (typically x10), a non-polarised light source, a transparent plate and a liquid medium between the instrument and the skin, and allows inspection of skin lesions unobstructed by skin surface reflections. Modern dermatoscopes dispense with the use of liquid medium and instead use polarised light to cancel out skin surface reflections., on the other hand, is performed based on a horizontal view of the entire lesion, but is generally limited in depth to the papillary dermis. Dermoscopy allows the observer to dentify “colorsThis glossary term has not yet been described.” and “structuresThis glossary term has not yet been described.” that are not perceived by the unaided eye. These colors and structures are two-dimensional surface projections of tissue structures (e.g., melanocyticThis glossary term has not yet been described. nests or blood vesselsare the part of the circulatory system, and microcirculation, that transports blood throughout the human bodyThis glossary term has not yet been described.). 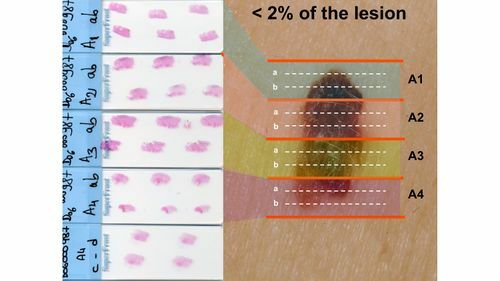 Aside from assessing the entire horizontal plane of the lesion, dermoscopy has two other major advantages: (1) the dermoscopist is able to examine additional lesions on the patient's skinThis glossary term has not yet been described., and integrate these findings; (2) dermoscopy allows the follow up of lesions. This provides important information regarding the lesion’s biology and dynamics. This page was last modified on 17 July 2018, at 20:04.